Eh ben ça se voit que c'est les vacances, je suis à fond côté production lol ! Hello! Thanks to the holidays, I can scrap nearly every days! 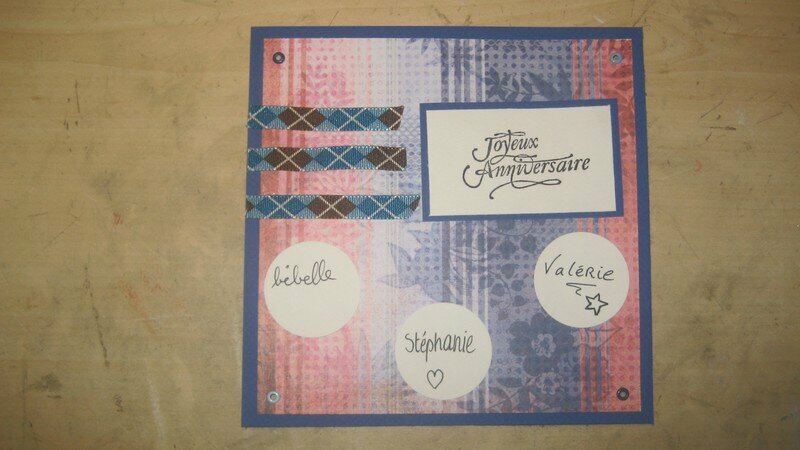 Matériel : Papier Basic Grey et Canson, rubans American craft, tampon "Joyeux anniversaire" et eyelets Queen & Co.
Wow wonderful Card. Really nice. A great card for the men! Your Dad will love it. très jolie cette carte Nanie!! bravo! Fab card, very good for men. Great colours on this card - hope he likes it. A stunning card! I love the colours you have chosen to use.